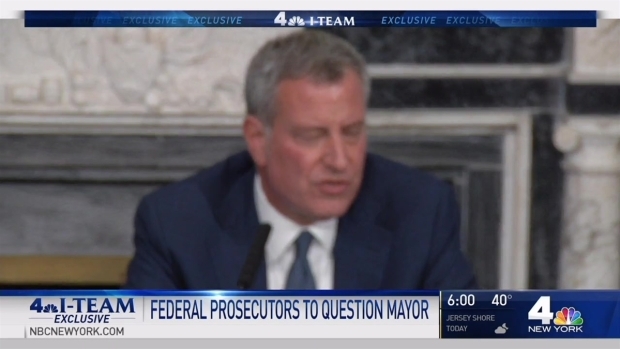 Mayor de Blasio has agreed to sit down with federal prosecutors in an attempt to convince them there were never any quid pro quos nor any trading of government favors for political donations during his time at City Hall, sources tell NBC 4 New York. The major development comes days after de Blasio was questioned by prosecutors in the Manhattan district attorney's office in a separate investigation into whether he routed donations to three Democratic senate candidates upstate to avoid donation limits. In the federal probe, prosecutors are looking into whether de Blasio and his aides traded government favors for donations to the mayor's nonprofit Campaign for One New York or his 2013 mayoral campaign. U.S. Attorney Preet Bharara's office had asked the mayor to come in and answer questions, and de Blasio has agreed, sources say. He plans to answer the questions without the protection of immunity. Sources close to the mayor tell NBC 4 he's agreed to the interview with federal prosecutors in part because he believes he can convince them he is innocent. De Blasio is expected to meet with them in the next two weeks, according to the sources. The mayor's strategy is bold and risky, legal experts say. A spokesman for the U.S. attorney declined to comment, as did an FBI spokeswoman. Berke has not returned numerous calls for comment. Mayor Blasio said Wednesday he has been questioned by the Manhattan district attorney's office, which is conducting an investigation into his fundraising activities. Melissa Russo reports. The planned meeting with federal prosecutors comes after the mayor met with the Manhattan district attorney's office. Prosecutors there are apparently wrapping up a separate criminal investigation into whether anyone at City Hall crossed any lines in helping raise money to try to help Democrats take control of the state Senate.